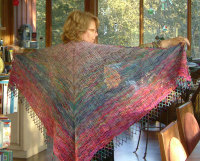 Now here is a project to cut any knitter down to size. Frost Flowers and Leaves from Meg Swansons' A Gathering of Lace, which is a wonderful book. 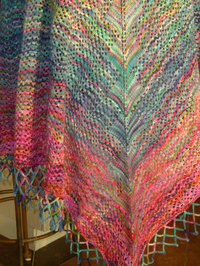 After 2 false starts, I am finally almost finished the second chart of this gorgeous shawl. It is fabulous. I just love the look of this lace. And I am so hooked on lace now that I think I have to start a 'dummy' project just for the nights when I cannot concentrate enough to work on the frost flowers. I've done my own version of a Charlotte's web type shawl using the same type of shaping but with a totally different lace and 6 colours of Koigu. 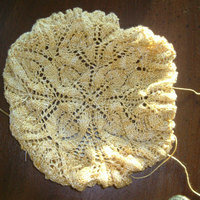 It turned out beautifully, and now I think I'll use another lace yet again, and do another one. 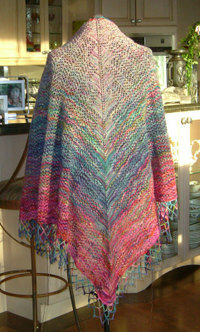 This time I think I'll use one of my stash lace yarns from Hand Maiden or Fleece Artist, but I'm not sure yet. Anyway, here is a picture of the Frost Flowers in progress, and another of my completed Koigu shawl.